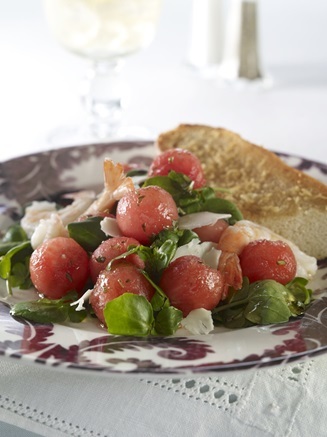 FEATURED RECIPE: SHRIMP AND WATERCRESS SALAD - What About Watermelon? Winter is the season for hearty, rich, warm foods, but it’s also the season for flavorful additions to your favorite dishes. Actually, that sounds like a good idea every season, and I’m perfectly fine with that. I picked this week’s featured recipe with flavor in mind for two reasons: I love seafood, and I’d like to get to know watercress a little better. You’ve probably seen or eaten watercress before and didn’t know it. It’s closely related to mustard greens, cabbage and arugula, and it can be used in all sorts of ways. In fact, the versatility of watercress is one of its best qualities, as it can be used in everything from salads, to soups, to sandwiches. Loaded with protein, and low in calories, this leafy green packs a punch in this recipe for Shrimp and Watercress Salad! Mix together the butter, garlic and parmesan. Cut the baguette in half. Slice the halves down the center to form four pieces of bread. Spread the butter mixture evenly over the cut side of each piece of bread. Place on the rack of a preheated 400-degree oven, and bake until browned. Wrap in foil and keep in a warm oven. Sprinkle the watercress over four salad plates. Add the watermelon balls, cheese and shrimp. Drizzle with vinaigrette, and serve with the warm bread. For more recipes like this, check out the “Recipes” page of the National Watermelon Promotion Board website. UP NEXT: WILL WATERMELON MAKE YOU A BETTER ATHLETE?